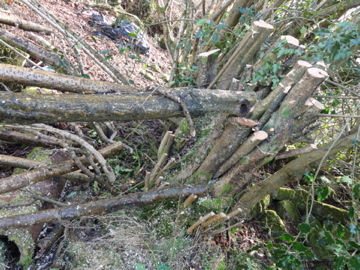 Mr has laid down so many hedge branches it looks like a storm has torn through, following the rut of the muddy stream. Dog is in the stream, picking up mud samples that will not exactly colour match the brown leather sofa. I throw the ball into some prone treetops and pretend Dog is flying. If you are prone to idiosyncrasy, the opportunities to make your own entertainment are increased. All along the hedges, the cut wood stumps of the hazel and the willow are pale as Ophelia floating drowned in the pond, while the alder is brassy like a vintage fake tan.